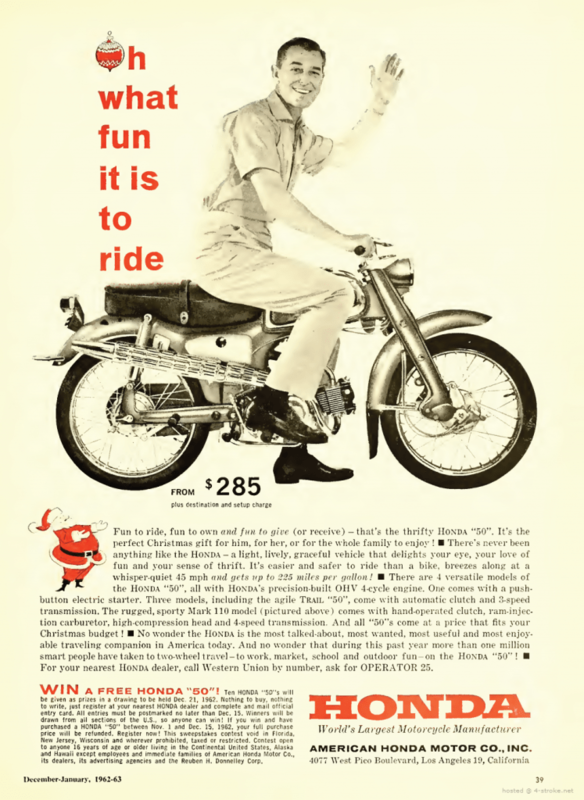 This article refers to C50, C70 and C90 models after 1977 and sold in the UK. When working on a later model always refer to this article first; where no information is given it can be assumed that the procedure is essentially the same as that described for the earlier models. It is essential to identify exactly the model being worked on; to assist the owner in this, the major identifying points of each are given below with the relevant frame numbers, where available. Where only one frame number is given, this is the number at which that particular model's production run commenced. Note that the frame number is the only accurate means of identifying a particular model. The Z-2 models are largely identical to the original versions, the only significant difference being the fitting of a new type of carburettor with a handlebar-mounted choke operated by cable. The Z-Z models can be identified by the conical-ended silencer. They employed modified components to give a revised gelselection pattern. The C50Z-A model, usually known as the C50L, was fitted with a single seat and carrier, but in all other respects it is the same as the C50Z-Z; to comply with the new legal definition of a moped it had no provision for carrying a pillion passenger. Note: the C50L must not be confused with the later C50LA models which employ a 3-speed fully automatic transmission. The C50-C, C70-C and C90-C models are easily distinguished by their two-tone dualseats and restyled headlamp cowling and legshields. They all feature modified air filters, 12 volt electrics and CDI ignition systems. In addition to this, the C90 engine/gearbox unit was completely redesigned and is now exactly the same in layout as that of the C70 model, its new bore and stroke dimensions giving a capacity of 86cc. The C70-E and C90-E models, also known as the 'Super Cub' or 'Economy' models, are largely the same as the -C models but feature heavily revised cycle parts with more angular styling and are fitted with larger, rectangular flashing indicator lamps and head lamps; a fuel gauge is fitted and the handlebar controls improved. The C90-E is fitted with modified selector components which enable neutral to be selected in one movement when the machine is stationary. The C50-E received the same styling alterations and new features described above but was also fitted with a completely redesigned engine/gearbox unit which featured many modifications to improve fuel economy; amongst other new features, a 4-speed transmission is employed. The C90-G, N and P models differ only in minor detail from the C90-E, and can be distinguished by their matt black-finished indicator lamps. The C90-M models are fitted with an electric start, the motor being bolted to a modified left-hand engine cover and driving the crankshaft via a chain ar.1d a roller-type clutch mounted on the inner face of the (reversed) generator rotor. The generator coils are now mounted on the inside of the left-hand engine cover; apart from minor alterations which do not affect servicing procedures the engine is otherwise exactly the same as the standard, kickstart-only, models. The electrical system incorporates a larger-capacity battery as well as the starter button and relay. The cycle parts remain unchanged. The earlier C90M-F models can be distinguished only by its chrome-plated flashing indicator lamps as opposed to the matt black-finished lamps fitted to the later C90M-G, M-N and M-P models; apart from this the differences are minor. I can't find my chasiss on this site? How much did you have to pay for your UK bike in '74? Honda Cub in "Shaun the sheep"